Recently I was lucky enough to have Christine Heppermann respond to my interview query about her Poisoned Apples: Poems for You, My Pretty, which I had the good fortune of receiving as a part of a prize lot of books. 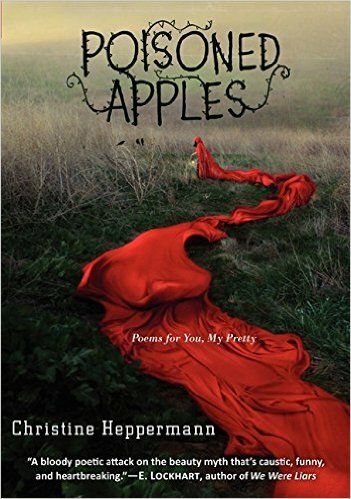 Her first YA poetry book, Poisoned Apples is sardonic, sassy, feminist, and charming. Beautifully printed, each poem is paired with a black and white photo or photo manipulation. Rhiannon Thorne: I read that you didn’t write Poisoned Apples with the conscious intent to write a feminist YA poetry collection, but you must have been aware of it on some level as you pulled the collection together. “A Brief History of Feminism”, in which you use the child’s game of Simon Says in order to explore patriarchy and male-dominance as well as sexual objectification of a young female, is right on the nose. Other poems explore the notion of beauty and advertising. What do you want young women to take away from reading Poisoned Apples? Christine Heppermann: I did get more purposeful with the feminist themes as the collection came together. “A Brief History of Feminism” reflects that, as it’s one of the last poems I wrote, when my editor asked me to add a poem here and there to flesh out the book. In the very beginning, though, I wasn’t thinking in terms of a collection. I was just writing! Once I had a substantial number of poems written, I was able to look at them together and realize, hey, there are patterns here. I guess what I most want young women to take away from the book is permission to question. To question everything and not believe that hearing something all the time automatically makes it true. 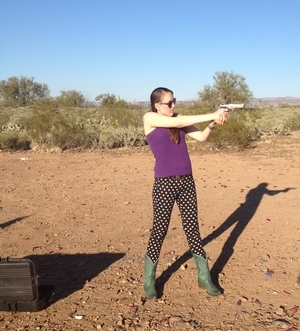 RT: I feel like sometimes we talk too much about our girls and what our girls can “do” to protect themselves from all these societal and adolescent pressures and not enough about our boys. What about the boys—what do you hope they’ll take away from Poisoned Apples? CH: Yes, I completely agree with you. I think one reason it’s so hard to question cultural norms is that they’re pervasive. They’re like oxygen, always in the air. Whether we’re conscious of it or not, we absorb beliefs about how we should be. Boys are supposed to be this way; girls are supposed to be that way, and so on. It’s hard to see how anything can change, how expectations can be thwarted or expanded, unless boys and girls at least feel like they’re having the same conversation. Otherwise, you have one side saying, “Something’s wrong here,” and the other side saying, “What do you mean? Everything is fine.” My hope is that Poisoned Apples can help start productive dialogue. RT: In your author’s note you give the advice, “Retell your own stories. Keep pushing your way through the trees, and I promise that, eventually, you will come to a clearing. And then you can dance.” To what extent are these your own stories? For example, you have a strong, reoccurring theme of anorexia, “The Elves and the Anorexic,” “The First Anorexic,” “The Anorexic Eats a Salad,” which, while mythic, sound close to home. CH: A lot of the poems capture how I felt about myself in middle school and high school, which is to say, not very good. I wasted a lot of time hiding in corners judging my looks, feeling like all my friends were the pretty, chosen ones, and I was a hideous beast (not realizing that they likely felt the same way about themselves). My experience with eating disorders comes from helping my oldest daughter survive one that hit her hard when she was eleven. “The Elves and the Anorexic,” for instance, is a reaction to watching her make big dinners for the family—she loved to cook—and then not eat any of the food herself. “The Anorexic Eats a Salad” also comes from watching her. Maybe mountains didn’t rise and fall in the time it took her to finish a meal, but close enough. “The First Anorexic” is about how, from Eve in the Garden of Eden onward, women haven’t been allowed to be hungry. When they are hungry—physically, intellectually, professionally—they’re punished for it. RT: I know parents aren’t supposed to play favorites, but indulge us: what is your favorite piece from the collection? What’s its origin story? CH: “Favorite” may not be the right adjective, since this poem is pretty bleak, but I’m most proud of “Blow Your House In.” I feel like I was able to capture how counterintuitive anorexic thinking is, as seen from the outside. It’s like “The Three Little Pigs” in reverse. Somehow the flimsy straw house, i.e. the least substantial body, becomes the most desirable. RT: Do us the favor of reading a poem or two from the collection? If you’re taking requests, I’d personally love to hear “If Tampons Were for Guys” or “A Brief History of Feminism”. RT: You were inspired by The Poets’ Grimm (an anthology of adult poetry) to write “The Woods,” which started your collection. What and who were your other influences? CH: Well, in high school, I wanted to be Anne Sexton—Minus the crippling personal demons and tragic end!—and her dark fairy tale retellings in Transformations obviously had a big impact. Back then I also loved Adrienne Rich and Sylvia Plath, and I still do. These days my favorite poet is Lucille Clifton, who died a few years ago. I really admire minimalists, and she could say more in five or six short lines than most writers can say in pages and pages. Because of her, I try hard to be precise with language and figure out the exact right words to convey what I mean. Not that I always succeed. But I try. RT: Do you have any upcoming projects you can give us a sneak-peak into? CH: I started working on many of the poems in Poisoned Apples over five years ago, when I was a student in Hamline University’s MFA program in writing for children and young adults. At that time those poems were mashed together with others inspired by my Catholic upbringing. Eventually the two groups split, and I had a second growing collection I called “Catholic Girl.” After much blood, sweat, tears, more sweat, more tears, and lots of whining, “Catholic Girl” morphed into a novel-in-verse. That book, Ask Me How I Got Here, will be published by HarperCollins/Greenwillow in 2016. Christine Heppermann’s books include Poisoned Apples: Poems for You, My Pretty (2014), City Chickens (2012), Backyard Witch (with Ron Koertge, 2015), and Ask Me How I Got Here (forthcoming, 2016). She currently reviews young adult books for the Chicago Tribune. Christine grew up in Omaha, Nebraska, where she attended an all-girls Catholic high school. As an undergraduate she studied philosophy and literature. She has a masters degree in children’s literature and an MFA in writing for children and young adults. Christine lives in New York’s Hudson Valley. Rhiannon Thorne currently resides in Southern California, where she is the managing editor for cahoodaloodaling and an associate interviewer for Up the Staircase Quarterly. 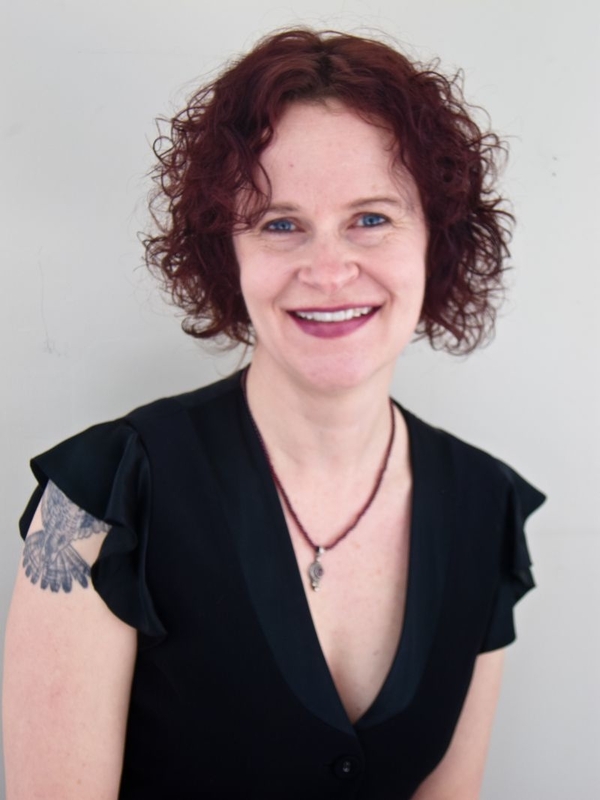 Her poetry has been published or is forthcoming in Midwest Quarterly, Black Warrior Review, and The Doctor T. J. Eckleburg Review, among others. Poisoned Apples: Poems for You, My Pretty can be purchased on Amazon US or Amazon UK.